Volatile organic compounds (VOCs) released from Chamaecyparis formosensis, Cryptomeria japonica, Cunninghamia lanceolata, Chamaecyparis obtusa var. 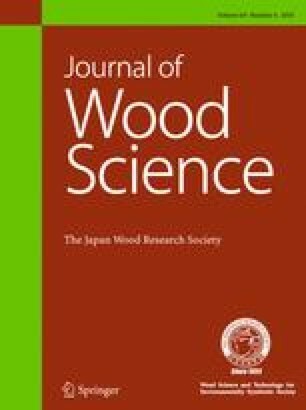 formosana, and Taiwania cryptomerioides five major building and interior decoration timbers and their essential oil components were analyzed using GC–MS and TD/GC–MS/FID. Results showed that C. obtusa var. formosana had the highest yield of essential oil (3.42%), followed by C. formosensis (3.14%), while C. japonica had the lowest yield (0.95%). Moreover, oxygenated sesquiterpene was the highest relative content in all five essential oils and their main constituents were trans-myrtanol (18.04%), 1-epi-cubenol (15.99%), cedrol (62.26%), α-cadinol (26.42%), and α-cadinol (27.98%), respectively. In terms of emission quantity of top VOC, the results showed the decreasing order of C. formosensis (myrtenal, 74.21 mg/m2) > T. cryptomerioides (thujopsene, 12.00 mg/m2) > C. lanceolata (α-cedrene, 10.27 mg/m2) > C. obtusa var. formosana (α-pinene, 8.05 mg/m2) > C. japonica (α-cedrene, 4.25 mg/m2). C. formosensis had a greater amount of VOCs emitted and hence gave off more fragrance than C. obtusa var. formosana initially. However, after indoor exposure of 24 weeks, the VOC emission quantity of C. obtusa var. formosana exceeded that of C. formosensis. α-Cedrene and thujopsene were the top two major VOCs of both C. lanceolata and T. cryptomerioides. However, they both showed a trend of decrease in emission with prolonged exposure. All five plantation timbers showed good antifungal, antimicrobial, antibacterial, and antitermitic properties, making them ideal materials for interior decoration. Not only do they have strong bioactivities, they can also provide a fragrant and healthy living environment. This study was supported by a Grant (107-A04-3) from the Experimental Forest, College of Bioresource and Agriculture, National Taiwan University, Taiwan, ROC. We also thank the Forestry Bureau for financial support.